Shopping malls can be evil and there’s not many I truly like to frequent in Victoria, or in Vancouver for that matter. But in Richmond, there’s one that I’d consider the galactic center of my universe for all the Asian food I can enjoy. Back in the day I thought Yaohan Centre was good, but no, it pales in comparison to what Aberdeen Centre offers now. From Japan to China, you can almost find anything you remember from home here. And my fondness for takoyaki can be found at Ajijiman Hanabi than at any other place in the district of Richmond or Vancouver. 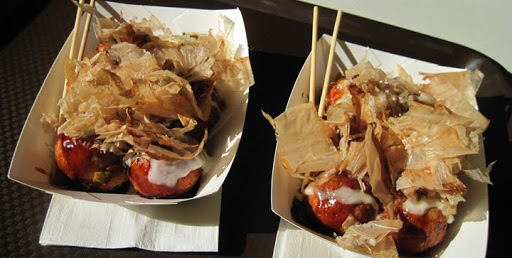 For $3.75, you can order 6 pieces of these warm gooey octopus balls. With shaved bonito leaves on top, it gives a great texture to complement the chewiness of the meal itself. But it’s the dressing that’s put on top which gets me savouring the meal. Traditionally it’s served with okonomiyaki sauce, which is similar to Worcestershire sauce but only sweeter and slightly thicker. I find I have to order two just to get my dose of heaven on Earth. But, of course, there are other places which serves this dish too. According to my Vancouverite friends, they say Ebi-Ten does a mean job, but I’d have to disagree. They don’t add anything more to the meal other than dress it up with sauce. Ebi-Ten is located on 388 Robson St, close to the Vancouver Public Library, and the big problem here is lack of space. It was crowded during the busy lunch hour, and by the time I found a quiet place, the take-out dish turned lukewarm. But truth-be-told, all any diner needs is an authentic frier and the ability to serve takoyaki hot. Don’t deliver it cold, like in what Fujiya’s does here in Victoria. That’s a huge no-no and I was nauseated when I saw it offered chilled. But herein lies my weakness; I love eating octopus and had to give it a try. I regretted eating it and will never buy that stuff from Fujiya’s ever again. This entry was posted in Food and tagged Food Courts. Bookmark the permalink.